I like this film more every time I see it. 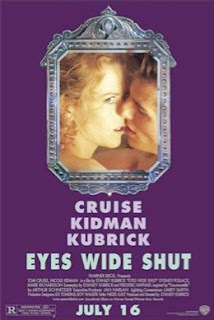 I was lukewarm to it at first (at least lukewarm compared to other Kubrick films but I still liked it quite a bit). I've seen it three times and it just gets better every time. From what I read, the novel this is based on was written in the 1920s. What a shocker that must have been. I wonder how torn Stanley was whether to set this in the 20s or the 90s? I actually think it is kind of amazing that he was able to set this in the 90s and still make it so creepy. We are so much more casual about these types of things now than people were in the 20s that the 20s seems like the logical setting. It's amazing how well he pulled this off in a modern setting. FYI - If you buy the Kubrick Criterion Collection blu-ray, The Killing, the movie Killer's Kiss is a bonus feature. I bought it a while back without even realizing the extra movie was on there. Nice bonus. Anytime you can get one of those Criterion Collection movies, you can't do any better. I have several and they are look and sound great and are filled with extras.